He didn’t like it when she spent time with her grown daughter from her first marriage, so when she got home she walked into a storm of “F”-yous and broken glass. She would ask him about a text on his phone and he would call her a snoop and filthy liar. They used to care enough to try and reconcile their differences. They used to try to get one another to see their point of view. Back then at least they were trying – even when it was harsh words and violent accusations. Now they live under the same roof – and even still share the same bed – but they don’t even look each other in the eye or communicate much beyond what’s for dinner. Susan experienced intense pain in her ankle as a result of a recent surgery. She stood up from the couch where they were both watching TV and fell to the ground in pain. The pain was so intense that tears streamed down her face. Her husband just sat there, watching TV, not even glancing in her direction or acknowledging her struggle. They’ve resigned to essentially ignoring each other so they don’t have to look pain in the eye and resolve it. They’re each trying to figure out how to ignore or sidestep the landmines of their marriage because neither has any fight left in them. And neither is accepting of the other. 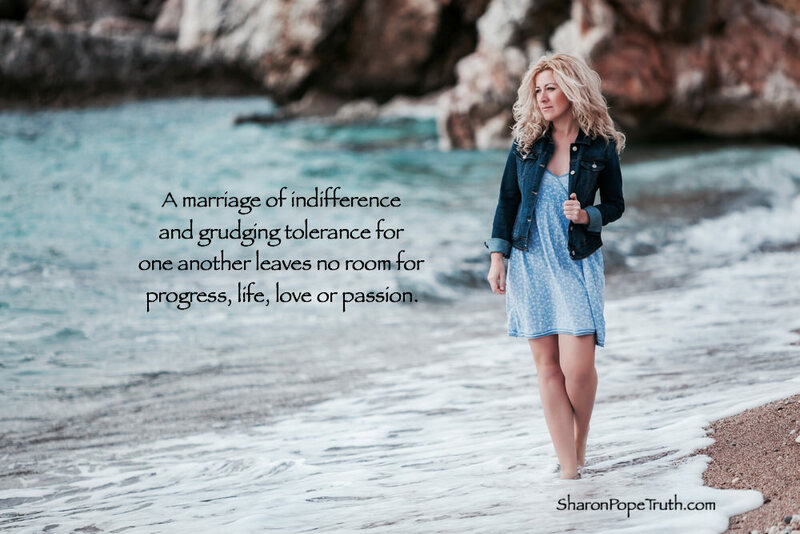 There’s just a grudging tolerance of a marriage that has them both feeling numb and empty, stuck and trapped. I’m not sure which is worse, the battle or the indifference. Both carry about the same level of toxicity. But, at least when there’s fighting, there’s movement in one direction or another. You either grow further apart or work through it and the potential to become closer exists. When there’s just indifference and a grudging tolerance for one another, there’s no movement, there’s no progress, there’s no life or love or passion. There’s just nothingness… except maybe hollow silence and muffled tears. And even though your life may no longer filled with anger and venom, you can’t stay in this place forever. Eventually, something has to shift. Someone or something has to give.